DW: ‘S&P sounds alarm over US debt ceiling.’ AW: Hurricane Harvey may cost $160 billion. The US ratings agency has warned that failure to raise the country’s debt limit by the end of September could have worse consequences than the collapse of Lehman Brothers during the financial crisis. US President Donald Trump has warned recently that he is prepared to shut down the government if he didn’t get funding for his controversial wall to be built along the Mexican-US border. The debt ceiling is a legal cap on how much money the government can borrow to fund its budget deficits and meet debt obligations. The United States actually surpassed its official debt limit at the end of 2012, but it has been suspended and reset multiple times over the years, most recently on March 15. The national debt currently is $19.84 trillion, compared to the $19.81 trillion limit. Failure to raise it from the current level could lead to default, sending shockwaves across global markets. Many have expressed concerns about the impact of the USA not increasing its so-called debt ceiling (see WP: 5 reasons why hitting the debt ceiling would be disastrous. COGwriter: Bible teaches something worse about debt.). It is ‘so-called’ because unlike real ceilings, this one has been raised repeatedly. The USA continues to spend money that it does not have. While I will refrain from commenting on the accuracy of forecasts from Accuweather, the reality is that disasters like Hurricane Harvey do cost money. And any money from the US Federal Government will be money that is borrowed. The moral direction and political acrimony in Washington, D.C. will prevent real solutions to the debt. Oh yes, the debt ceiling will be raised (‘legally’ or otherwise), but that will not reduce the debt of the USA. The USA is going in the wrong direction and needs to repent. to cities and all who dwell in them. (Habakkuk 2:6-8, ESV). The increasing USA debt is so serious that people need to take action–which is why God said people should run once they understand it. While Standard & Poors is correct that the debt-ceiling should set off alarms, the alarms it should set off is that the USA needs to change and quickly work to reduce its debts. Posted in Prophecy | Comments Off on DW: ‘S&P sounds alarm over US debt ceiling.’ AW: Hurricane Harvey may cost $160 billion. Karl-Theodor zu Guttnberg is again in the news. BERLIN: The man once touted as Germany’s chancellor-in-waiting before his sudden fall from grace made his long-anticipated return to German politics on Wednesday with a speech hailing Angela Merkel as the right person to steer her country in uncertain times. 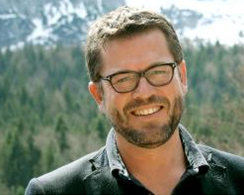 Karl-Theodor zu Guttenberg, who was Germany’s most popular politician until brought down, aged just 38, by the revelation that he had plagiarized his doctorate, presented himself as a chastened figure. “I want to thank those people who, quite rightly, sharply criticised me for my failings. I learned much from them,” said the former defence minister, who has spent the past six years working for an investment firm in New York. Guttenberg was received enthusiastically by members of his conservative Christian Social Union (CSU) party in the Bavarian town of Kulmbach, where the aristocrat’s former family castle is located. He “fell from grace” because of a plagiarism scandal, yet Baron Guttenberg is still commanding a lot of attention. The tendency to connect politics with a touch of theater – in this case cabaret – has been preserved by the baron. For example, when he tells how President Trump is turning a light bulb: “He’s going to a chair, waiting for the world to turn around.” The fact that with Mike “Mickey” Pence and Donald Trump times two Disney figures in the White House sat, probably not even their creator dreamed. Guttenberg is a politician, Kim Jon Il calls him a “Dickmops with funny haircut”. Sigmar Gabriel is currently undergoing a “slimming down”, he hopes that the foreign minister will not start with marathon runs and ends like Joschka Fischer as a “drizzle”. Die Neigung, Politik mit einem Touch von Theater zu verbinden – in diesem Fall Kabarett – hat der Baron konserviert. Zum Beispiel wenn er erzählt, wie US-Präsident Trump eine Glühbirne eindrehe: “Er steigt auf einen Stuhl und wartet, dass sich die Welt um ihn dreht.” Dass mit Mike “Mickey” Pence und Donald Trump mal zwei Disney-Figuren im Weißen Haus säßen, habe sich wohl nicht mal deren Schöpfer träumen lassen. Guttenberg zieht über Politiker her, Kim Jon Il nennt er einen “Dickmops mit lustigem Haarschnitt”. Sigmar Gabriel mache gerade eine “Verschlankung” durch, er hoffe, der Außenminister fange nicht auch noch an mit Marathonläufen und ende wie Joschka Fischer als “Dörrzwetschge”. He continues to make various statements about international politics, Donald Trump, and Brexit. Brexit is something that the Europeans fully blame on the UK. This will not end well for the UK. Getting back to Karl-Theodor zu Guttenberg, in 2015 he called Donald Trump “that blonde lunatic named Donald” (Wish List or Reality? Digital Trends in 2016 | Karl-Theodor zu Guttenberg | hub conference. https://www.youtube.com/watch?v=dgdZUA96UBU. Posted December 11, 2015; watch also Karl-Theodor zu Guttenberg and Europe’s Future). former German Defense Minister Karl-Theodor zu Guttenberg has called on Berlin to ditch what he called its “passive, wait-and-see” attitude towards the United States and nurture “a culture of responsibility” instead. Many in Europe agree with Herr Guttenberg’s assessment of Donald Trump. The Bible shows that Europe will ultimately turn to a ‘strongman’ of its own in Revelation 17:12-13. This may very well be Karl-Theodor zu Guttenberg. At minimum if it is not him, I believe he would support the one that the Book of Daniel calls final King of the North and the Book of Revelation calls the Beast of the Sea. Even since his self-imposed exile, he has been in the news on a fairly regular basis. I expect that Karl-Theodor zu Guttenberg will further encourage Europe to try to take the lead on more international matters. He has advocated more European military cooperation. He became unpopular for a time (and still is among many). He ended up, for a time, outside of political office. He went out of the limelight for a while. He went into exile (self-imposed). His exile was to a humid location. He has partially re-emerged in European politics. He has called for Germany to consider being a leader in data protection. He now has a beard. Note: He did NOT have a beard when I first posted something that indicated that he could get one. He is also urging Germany to take steps that would tend to distance it from being under USA leadership. Several of those predictions were based upon my understanding of prophecies in the books of Daniel and Revelation. Others were based on outside sources that were not in conflict with biblical ones. While these 9 speculative predictions do NOT prove that he is going to be the final King of the North European Beast power, he bears watching. His statements and actions are consistent with one who will be, or at least will support, something in Europe that the Bible warns against. Law number six, then, is PERSEVERANCE—stick-to-it-iveness! Still We Need Law Number 7! Well now, it would certainly seem that if one follows these SIX laws of success, nothing more should be required! But still, these “successful” men I have described followed these six principles. They gained their goals. They made money. They attained recognized status. They enjoyed the passing pleasures. Still their lives were empty—they were never satisfied—they were discontented, they never found lasting, permanent, enduring happiness—they did not take their acquisitions with them when they died, and their fame died with them! What they lacked—what ALL lack who fail of REAL success, application of Success Law number 7—the most important law of all! That is the ingredient that would have changed everything? I have reserved this all-important seventh Law till last to explain. But far from being least, it is first in vital importance! I have held it till now because 1) it is the very last one that people will acknowledge and apply; and 2) being first in making possible real success, I want to state it last so it will remain stamped in the mind of the reader. When serious illness strikes, people call the doctor. It is automatic for most to rely on human professional knowledge and skill—on material drugs, medicines and knives. But finally, when the attending physician—perhaps with specialists called in collaboration—gravely shakes his head and says there is no more that medical science can do—it is now in the hands of a higher Power—then, at last people cry out desperately to the Creator God! Is it possible that the living GOD might be a factor in determining the success or failure of one’s life? Few have thought so. People will ignore all their lives any idea of divine guidance and help—yet if one should find himself on a foodless and waterless raft after a shipwreck in mid-ocean, it is remarkable how quickly he would begin to believe there really is a living God! In last-resort desperation most people will cry out to Him whom they have ignored, disobeyed, and set at naught all their lives. Wouldn’t it seem axiomatic that, if there is a compassionate beneficent Creator standing ready and willing to give us emergency help as a last resort, it would have been more sensible to have sought His guidance and help all along? Yet some have acquired wealth, lived luxuriously, and then, suddenly losing all, turned finally to God in their economic distress. Others have committed suicide. Few, it seems, will ever rely on their Maker and life-Sustainer until they feel helpless and in desperate need. Even then the motive too often is selfish. Yet, if we are to enjoy the good things of life—freedom from fears and worries, peace of mind, security, protection, happiness, abundant well-being—the very SOURCE of their supply is the Great God! Since all comes from Him anyway, why not tap the SOURCE from the very beginning? But in our day of modern science, sophistication and vanity, it has not been fashionable to believe in a Maker. In this deceived world, knowledge of God has found little or no place in modern education. The ALL-IMPORTANT seventh Law of Success, nevertheless, is having contact with, and the guidance and continuous help of GOD! And the person who does put this all-important seventh law last is very probably dooming his life to failure at the end. Look again at the very first Law, as it has been listed here. It is not merely choosing a goal—any goal. It is setting as one’s life-aim the right goal. The “successful” of this world all had goals. But their goals led to material ends. They sought happiness in vanity, pride of status, material acquisitions, physical activities and pursuits. They sought the approbation of people. But people are human, and their lives are temporary. Material objects, too, are not enduring, but wax old until consigned to disuse. The main goals of those supposed to be successful in the world usually are two: Vanity—desire for status; and money with the material things it will buy. But happiness is not material, and money is not its source. Vanity, as Solomon observed is like a striving after wind! These men I have mentioned made money. Their bank accounts may have been full, but their lives were empty. When they acquired money, it never satisfied, and always they wanted more. These monetary victories, these material acquisitions, gave, of course, a thrill of satisfaction—but it never lasted! This life-long struggle—this constant striving “after wind”—striving after false values—left in its wake a trail of fears and worries, apprehensions, disappointments, heartaches, troubled consciences, discontent, empty lives, frustrations—and finally, DEATH! Oh yes, of course there were pleasures, moments of excitement, periods of enjoyment. There were occasional thrills, temporary sensations of delight. But always they were followed by periods of depression. Always a gnawing inner soul-hunger returned. This in turn drove them to seek satisfaction in the thousand-and-one events in the world’s whirl of material pleasures and pastimes. Yet these never filled the void. They never satisfied the real inner hunger. These people probably didn’t realize it, but the hunger was spiritual. And spiritual hunger is never satisfied by material food! The “successful” of this world applied six of the success laws. But they left GOD out of the picture, and the happiness of real success out of their lives. It seems almost no one, today, realizes HOW—and WHY—we were made. WHAT we humans are, and WHY we are. Why should we live in ignorance of these basics of knowledge? 1. While man was made a material being, of the dust of the ground, sustained by eating material food and drinking material water, he was made also to need spiritual food, and to drink of the “living water” of God’s Spirit. Without these spiritual needs man cannot be truly and continually happy. Nothing else really satisfies. 2. The Eternal Creator, who made us in His own likeness, is creator of ALL that is. Everything man needs to make life continuously and abundantly satisfying, must come from Him. He is the SOURCE OF SUPPLY. He is the GIVER of everything good. WHY must men ignore the true SOURCE, and try to obtain where there is nothing to be obtained? If I wish to draw clear, sparkling drinking water from a well, I will go to a well filled with such water, not to one that is empty. God says of our people: “For my people have committed two evils; they have forsaken me the FOUNTAIN of living waters, and hewed them out cisterns, broken cisterns, that can hold no water” (Jeremiah 2:13). Once again, look at the first of the Success Laws. Stated another way, it is to DEFINE SUCCESS! And what constitutes real Success? Once you have learned the true meaning of Success, then you have found the only right goal. The right goal sets the direction of your life’s journey. Success is the destination of that journey. Success is where you finally arrive—and true Success includes a happy and enjoyable journey along the way. Is there, after all, a PURPOSE to life? If we were put here by a Creator, would He have put us here without a REASON? And a Creator with Mind and Power that could have designed and produced the human mind and body could have failed to make available for humans every tool, ingredient and facility needed to fulfill His Purpose! Of course men cut off from God have no knowledge of that Purpose. For that knowledge is not material, but spiritual knowledge. And spiritual things cannot be seen—nor heard, felt, smelled or tasted. Spiritual knowledge can be transmitted only by revelation. And this world has rejected revelation. Men cut off from their Creator of necessity are spiritually blind and ignorant, groping in the dark. So they fail to seize the proper tools, ingredients and facilities. But the Maker has sent an instruction book along with the human mechanism He made. It contains all the real answers. It reveals life’s real PURPOSE—the potential destiny of man! That instruction book, as Bruce Barton aptly said, is the “book nobody knows.” Almost no one knows that 95% of the contents of that Book is virtually ignored by the professing Christian clergy. Most scientists and educators today suppose, erroneously and in ignorance of the facts, that the Bible is merely the book of an ancient race of Jewish people, striving to devise a concept of a god—in by gone days of ignorance and superstition. They don’t examine the Book, as they examine other data, to see what it says. They ignore it as something beneath their pride of intellect to consider. The religious Bible-believing fundamentalists generally quote and use not more than some 5% of the Scriptures. Approximately one-third of the entire contents of the Bible is devoted to ADVANCE NEWS REPORTS, called, in religious terminology, prophecy. FEW pay any attention to this third of the writings—and most seem devoid of understanding. What almost ON ONE realizes is that the ignored 95% of that great volume is the INSTRUCTION BOOK which the Maker sent along with His product—just as any manufacturer of a material commodity does. Yet some scholars today have been surprised and shocked to learn that this ignored, maligned, misrepresented Book contains THE ANSWERS to life itself—reveals the PURPOSE of life—the LAWS that govern it—the ANSWER to what IS Success, and how to achieve it! It has been like discovering a gold mine of knowledge they did not know existed. They have found that it MAKES SENSE—that, indeed, IT IS THE VERY FOUNDATION of KNOWLEDGE in just about all areas—that it provides the only right approach to the acquisition of further discoverable knowledge. This ultimate potential destiny is the only TRUE goal. It is your reason for being alive! It is the reason you were born! Those who have worked, striven, fought their way to any other goal have been wasting their lives—living for naught! They have, in true fact, been going nowhere! And how many, since humans were first put here on earth, have really known that PURPOSE—that one right goal of life? Very few, indeed! The time when we need divine guidance, enlightenment, and help, is at the very BEGINNING—at the time when a young man or woman chooses that RIGHT GOAL. Without divine guidance the wrong goal is always set. That is why poor people possessing the least knowledge and material goods sometimes appear to be the happiest. Actually they were not happy. They merely are less discontented! They have not progressed as far in the WRONG DIRECTION as those who smugly and vainly supposed themselves to be their more intelligent betters! Life has a PURPOSE. God has set in actual, inexorable motion definite LAWS to PRODUCE for man every happiness, security, and GOOD thing he desires—THE WAY OF LIFE that will fulfill God’s PURPOSE for our being! WHAT, then is the PURPOSE for which we were put here? Of this, mankind has totally lost all conception. To people spiritually drunk on the false material concepts of our day, the statement of that purpose would appear strange, absurd, impossible. It SO FAR transcends anything conceived by humanity in this blinded world that the statement of it would prove too great to be grasped and accepted. Suffice it to say—and I shall leave it to another booklet to explain—man was put here for the PURPOSE of being conformed to, and finally stamped with the exact perfect CHARACTER of Jesus Christ! Write for the free booklet Why Were You Born? Christ is now stamped with the identical CHARACTER IMAGE of God, as well as the shining, brilliant, glorified appearance of God! For a mortal human to be transformed into that perfect spiritual image means that we must be CHANGED! The Bible pictures God as the Master Potter—us as the clay. Indeed we are, literally clay images of God—composed of the dust of the ground (Genesis 2:7). As we now bear only the physical image of the “earthy,” we shall when changed, bear the spiritual image of the heavenly—of GOD (1 Corinthians 15:47-49). So we are clay images with human minds that are free moral agents. They may submit, or they may rebel. They have power of will, and of decision. Understand this! You are a free moral agent. God will never “cram” His religion down your throat.” He will never force you to decide His way or go His way. He not only allows you to choose the wrong way—He compels you to make your own decision. Otherwise His PURPOSE would be thwarted! The living God has set two ways before us. One, His Way, the cause of all the good things you want here and now, plus eternal life in REAL SUCCESS continuously forever. The other the way of self-centeredness, vanity, greed, envy—the way mankind has gone, in rebellion against God and His Law—the way that causes all unhappiness, suffering, evils, and ends in death. And God compels you to choose! Yet He commands you to choose the Way that leads to REAL SUCCESS (see Deuteronomy 30:19). That ultimate TRUE Success is something you cannot attain to by yourself. The ingredient you lack is the GUIDANCE, the POWER and SPIRIT OF GOD. You must make the decision. You must set this right GOAL. You must set your will. You must expend your full effort. You must WORK AT overcoming, growing and developing spiritually, and sticking with it. Yet GOD supplies the all-important ingredient—His power, His love, His faith—His guidance—HIS LIFE! Now look how DIFFERENT a whole life becomes when this SEVENTH SUCCESS LAW is utilized. First, it will completely alter your overall major GOAL as I have just explained. Of course, you will have other minor goals—such as the profession or occupation to provide material needs, and HELP achieve the major goal. And these minor goals always must be compatible with and contributing to the major goal. Your main goal, now, will be spiritual and not material. It will follow the WAY OF LIFE of the Ten Commandments. You will actually LIVE BY every Word of GOD—that is, the Bible! Now re-examine the Second Law of SUCCESS. Your EDUCATION and entire preparation will be DIFFERENT. You will seek to learn the TRUE VALUES of life—yes, of this life as well as the hereafter! This means your number one textbook will be the BIBLE. It will reveal to you the MIND OF CHRIST. This will provide your mental APPROACH in all education and practice. Third, you will receive the KNOWLEDGE which God reveals about laws of HEALTH. Take the FOURTH LAW. If you are motivated by GOD’S WORD, you’ll have DRIVE. God commands that you do what you do with your might! Apply yourself! Whatever is worth doing is worth doing the very best you can! Nine Biblical passages command that you apply your self with DILIGENCE! Ten other places in the Bible command us to BE DILIGENT. And 36 Scriptures command, or show the example of acting diligently! Many of these instruct us diligently to seek God’s guidance and help, several diligently to keep His commandments. How about the businessman? “Seest thou a man diligent in his business? He shall stand before kings; he shall not stand before [obscure] men” (Proverbs 22:29). The Bible does not condone laziness or shiftlessness. It counsels us to consider the ant and be wise. The Bible commands industriousness! Now, Law Number FIVE. No matter how intelligent, alert, or resourceful you may be, YOU NEED GOD’S WISDOM and HELP in solving the constant problems and meeting the recurring obstacles that beset life’s path. Whether it is in business, a profession, private life or what. The man who has CONTACT WITH GOD, who can take these matters—these emergencies—these problems—in the quietness of his private prayer room to the Throne of Grace and seek God’s counsel and advice IS GOING TO HAVE DIVINE GUIDANCE! That is, of course, provided he is submissive, obedient, diligent, faithful. WISDOM comes from GOD. May I give you a personal example? God has blessed His Work, and caused it to grow into a tremendous worldwide activity, with offices around the world. God has set me in the position of human director and leader over this expanding enterprise, employing hundreds of people. We encounter problems of all kinds, constantly. I have problems to solve, obstacles to hurdle, policies to set, decisions to make which affect many lives—frequently involve many thousands of dollars, even millions. It is a weighty responsibility. Always—and I can remember it from at least age 5—I have desired to have UNDERSTANDING. But more than fifty years ago, I discovered that I sadly lacked, yet sorely needed WISDOM. Having dedicated my life to live, literally, according to every word of God’s Instruction Book—the Bible—I obeyed this command of God: “If any of you lack wisdom, let him ask of God. . . and it shall be given” (James 1:5). He has given me wisdom. Of course He has allowed me to make mistakes—but never a major mistake that could threaten His great Work. Wisdom must be applied to every specific circumstance individually. I learned many years ago the need of getting all of the facts bearing on a case before making a decision. But it requires more. God’s Word says that in multitude of counselors there is safety. In any important decision I call in the most competent possible counselors, specialists in the field involved. You simply cannot know, if you have never had this divine help, how very, very much it means! We have been saved hundreds, of times from costly blunders. We are saved from worries and the “headaches” most businessmen have to suffer over such problems. We can proceed in CONFIDENCE—that assurance that is FAITH! What a blessing! What a comfort, and a joy! People trying to live without the living CHRIST in their lives are missing the most practical and valuable asset they could have. In the language of our day, “IT PAYS OFF!” Of course, we have to expend our own effort. We have to really THINK. We use all our own effort. We have to really THINK. We use all our own resources and natural resourcefulness. But we have that added SECURITY of divine GUIDANCE. Often God simply works out CIRCUMSTANCES. He literally gives us “the breaks”! IT PAYS! Finally, now, look at Success Law Number SIX. Perseverance—Stick-to-it-iveness—Enduring—Never quitting or giving up. The Maker’s Instruction Book seems full of this. Jesus’ parable of the sower and the seed showed the four classes. All heard God’s Message. All were given the opportunity. Three classes GAVE UP. One never really got started. Two started out with joy and a great flourish, but let former friends, the cares of this material life, pleasures, choke them off, and discourage them. The other class of quitters simply did not have the depth of strength of character within themselves to stay with anything. They were just naturally quitters. Even of those who went on, and endured, some were more diligent, more resourceful, better prepared, more careful of health, and consequently developed farther in accomplishment than others. Theirs will be the greater reward! Jesus Christ said, plainly, “He that endureth unto the END, the same shall be SAVED” (Matthew 24:13). Yes, these Seven Laws are the WAY, not only to business and economic SUCCESS—they are THE LAWS that lead to rich, rewarding, interest-filled, abundant living and, in the end, to ETERNAL LIFE AND GLORY in the Kingdom of God. It teaches you to choose the RIGHT GOAL. It teaches you to STUDY, to show yourself approved to your Maker. It teaches you to acquire KNOWLEDGE, right and true education—preparation for success. It teaches you to watch your health. It teaches diligence—drive—dedication, persistent application. It teaches resourcefulness, and offers you divine help in applying it—and it teaches STAYING WITH IT TO THE END! WHAT A HAPPY LIFE God haw made available! What blessedness,–what JOY! What SECURITY, this life of implicit living FAITH—reliance on the Creator—GOD! I know! I’ve been enjoying this life for more than fifty years! It’s a BUSY life—but it’s interesting, thrilling, happy, abundantly REWARDING! And to constantly look forward to the OVERALL GOAL—an eternity in THE KINGDOM OF GOD! I want to SHARE that life with you! You may enjoy it too! Christians should pray, study the Bible, and rely on God. It probably should be the “first law of success” though I think I understand why Herbert Armstrong listed it as the seventh. The Seven Laws of Success Information by Herbert W. Armstrong that can help people become successful. Christian Success Does the Bible teach that Christians are to be successful? Are there at least seven laws of success that Christians should follow? How does the Bible teach we are to become successfully spiritually? Does the Bible really teach that Christians should be successful physically? This video answers these questions and more from the Bible. An outline of some of the scriptures used is here: Christian Success Outline. Rain and floods continue to affect Texas and Louisiana: Who controls the weather? HOUSTON — The devastating storm once known as Hurricane Harvey, already the biggest rainstorm in the history of the continental United States, delivering another punishing wave of rain Wednesday to Texas and Louisiana. 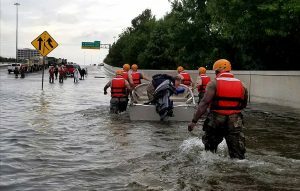 Texas Governor Greg Abbott has said that “the worst is not yet over” for the south-east of the US state, after devastating Tropical Storm Harvey. He said rain continues to fall and flooding in certain areas may last another week. More than 20 people are reported dead, and large parts of the city of Houston are under water. in Louisiana, the storm landed in the south-west corner of the state, around Cameron, in the early hours of Wednesday. It is predicted to travel in a north-easterly direction, weakening as it goes. The National Weather Service said heavy rainfall was expected from Louisiana to Kentucky over the next three days. Tropical Storm Harvey broke all records for rainfall from a single storm in the continental United States, and its consequences are likely to be felt for years. While the worst of the storm has cleared out of the Houston area, know that this story is not yet over. It’s just beginning. Tens of thousands are displaced from their homes, search and rescue operations are still underway, flood waters have not yet receded, and the total cost of the storm has yet to be fully tallied. Cleanup and rebuilding efforts will likely take years. And the storm itself continues to dump rain over East Texas and Louisiana. Those affected by Hurricane Harvey are in my prayers. The “broke all records” report should show us that we cannot be complacent and that things, including weather, can change beyond what it ever has before. Storms like Hurricane Harvey show us that the world can quickly and dramatically change. As the above shows, the Bible teaches that God uses weather to warn people and to get their attention, especially if they have left Him. (A couple of days ago, I quoted scriptures related to God controlling heavy rainfall, those are in the news post: Harvey’s “Unprecedented” Devastation, “No Parallel To Any Rainstorm In US History.”) God’s word also say He can bring floods (see Weather Blessings and Sorrows). Weather is not as random as most seem to want to believe. And while there has never been a human society with perfect obedience, nations like the USA, who once had more respect for the Bible, at least used to make more of an effort to obey more laws of God than we now see. Expect more weather problems, including blight and mildew, in the unrepentant USA. I believe, for example, that God allowed superstorm Sandy which likely affected the election, in the favor of Barack Obama. Others may disagree, but for the past 2-3 years I felt that something would occur within a week or so of the 2012 US presidential election. And while superstorm Sandy was still going on, I discussed this with some I work with prior to the election, and mentioned that I felt that the superstorm would affect the election. The Bible clearly teaches, “the Most High rules in the kingdom of men, and gives it to whomever He chooses” (Daniel 4:25). Weather events should serve as a wake-up call. Things in the USA will not remain as they have been. Expect worse weather incidents to come. Do not be complacent or lukewarm (cf. Revelation 3:14-18). Change will happen. Much more so than most believe. Expect that the time will come when the USA is no more (cf. Daniel 11:39; see also USA in Prophecy: The Strongest Fortresses). The ‘Unpardonable Sin’ and ‘Climate Change’? On September 7, 2016, Olav Fykse Tveit, Church of Norway Pastor, and the General Secretary of the World Council of Churches, essentially declared that those who ignore ‘climate change’ are committing the ‘unpardonable sin’ against the Holy Spirit. Are those two even related? In this video, Dr. Thiel answers that and explains from the Bible what the ‘unpardonable sin’ is and how you can avoid it. He also discusses aspects of Christianity and the environment. British are the Covenant People What do ‘British’ and ‘Britain’ mean in Hebrew? Are the descendants of the Anglo-Saxons people of the covenant? Does the British royal family connect to the throne of David? What does the Bible teach? What does history show us? Is there any DNA evidence related to British-Israelism? When did Christianity make it to the British Isles? Could Jeremiah have made it to the British Isles? What type of Christians made it to the British Isles? Did the last King of England believe in British Israelism?Donald Trump in Prophecy Prophecy, Donald Trump? 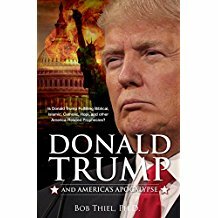 Are there prophecies that Donald Trump may fulfill? Are there any prophecies that he has already helped fulfill? Could a Donald Trump presidency be apocalyptic? A related video is titled: Donald: ‘Trump of God’ or Apocalyptic? Posted in Doctrine, Prophecy | Comments Off on Rain and floods continue to affect Texas and Louisiana: Who controls the weather? UN warns Donald Trump has threatened press freedom. What about Germany and YouTube? Zeid Ra’ad al Hussein, the United Nations’s top human rights official, said US President Donald Trump’s relentless attacks on news outlets like the New York Times, the Washington Post, CNN, ABC, CBS and others could be seen as incitement to violence against journalists. “It’s really quite amazing when you think that freedom of the press, not only sort of a cornerstone of the US Constitution but very much something that the United States defended over the years is now itself under attack from the president,” he told a news conference on Wednesday. “It’s a stunning turnaround. And ultimately the consequence is a dangerous one,” he added. The highest-ranking U.N. human rights official is warning U.S. President Donald Trump’s repeated criticisms of the news media could incite violence against journalists. 12. Donald Trump has made some statements suggesting he is not fully in agreement with the right of free speech. A “famine” of the word is prophesied (Amos 8:11) and it is possible that he could authorize steps that could lead to that. Yet, it is not just Donald Trump that is a threat to freedom of speech and the press. There are many in the USA, in both of the major political parties, that do not truly endorse those freedoms. But this problem is not unique to US politics. Canada has major issues with the Bible (see Canada celebrates its 150th, but pushes internet and biblical censorship). Even the press, including sources like The Guardian of the UK are pushing for restrictions (watch Orwell’s 1984 by 2024?). Posts critical of Chancellor Merkel’s migrant policies, for example, can be categorized as “Islamophobia”, and are often found to violate “Community Standards”, while incitement to actual violence and the murder of Jews and Israelis by Palestinian Arabs is generally considered as conforming to Facebook’s “Community Standards”. Notwithstanding the lawsuits, Facebook’s bias is so strong that it recently restored Palestinian Arab terrorist group Fatah’s Facebook page, which incites hatred and violence against Jews — despite having shut it down only three days earlier. In 2016 alone, this page had a minimum of 130 posts glorifying terror and murder of Jews. Actually, Western Europe is reinventing itself as a type of the old ‘Holy Roman Empire’ that will include violence–somewhat reminiscent of the Spanish Inquisition. 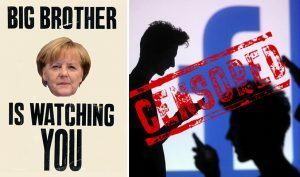 Germany’s cabinet just approved a bill that would levy fines up to €50 million against social media companies that fail to remove “hate speech” or “defamatory fake news.” This comes less than a year after Facebook, Twitter, YouTube, and Microsoft agreed to a Code of Conduct with the European Union, requiring them to review and the majority of “valid notifications” of “illegal hate speech” within 24 hours. The Associated Press wrote that Germany “poses a particular problem for U.S.-owned social networking sites accustomed to American standards of free speech.” This is an understatement. In addition to the First Amendment, Section 230 of the Communication Decency Act protects social media companies from liability for their users’ content. In contrast, all European countries have hate speech laws and the European equivalent to Section 230, European Commission E-Commerce Directive 2000/31, only grants platforms immunity if they were ignorant of the illegal content and promptly remove it once notified. On October 2, 2016, we put up a video titled Internet Control, Famine of the Word, and 666. YouTube did not immediately respond to a request for comment. As far as religious extremism, please understand that some in the USA believe that ALL who believe in the millennial reign of Jesus are religious extremists and potential terrorists. Also, the message of the good news of the Kingdom of God is also considered to be religious extremism by many. Freedom of religious speech is threatened on many fronts. Other than changing content (which is not really an option), paying for YouTube advertising (which we do not have the budget for), or perhaps adding more graphics (which we plan to do), it is unclear how to get around this more subtle form of censorship that YouTube is now engaging in. The Bible teaches that a totalitarian European state dominated by Germany will rise up (see also Germany in Biblical Prophecy)–and the USA is assisting in this process (see also The Snowden Leaks are Leading to the Destruction of the USA). Yet, there is good news as the Kingdom of God will come and replace the Beast’s system (Revelation 17:14) that we see being put together today. The Spanish Inquisition and Early Protestant Persecutions Was the Church of Rome really responsible for this? What happened? Germany in Biblical Prophecy Does Assyria in the Bible equate to an end time power inhabiting the area of the old Roman Empire? What does prophecy say Germany will do and what does it say will happen to most of the German people? Here is a version of the article in the Spanish language: Alemania en la profecía bíblic. Here are links to two English language sermon videos Germany in Bible Prophecy and The Rise of the Germanic Beast Power of Prophecy. Posted in Prophecy | Comments Off on UN warns Donald Trump has threatened press freedom. What about Germany and YouTube? A reader informed me that Triumph Prophetic Ministries William Dankenbring died yesterday. He died on August 29, 2017, around 1:00 pm. The cause seems to have been of congestive heart failure and renal failure. UPDATE: The reader later told me that the actual date of WD’s death was August 28, 2017–sorry for any confusion. William Dankenbring was a prolific, though often inaccurate, writer. He used to write for the old Radio and Worldwide Church of God until he left and went out on his own. 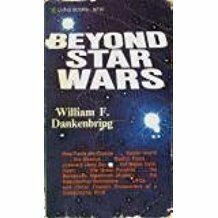 Although I heard about him originally in the 1970s, my first encounter with William Dankenbring was about 25 year ago. I wrote to him then objecting to some of his writings and asked to be taken off of his mailing list–a mailing list I had never asked to be on. Well, he was not pleased and wrote a tirade against that, which he published. All my encounters with him over the years were negative. William Dankenbring made many false predictions over the years that I have denounced. He was always in error on those I denounced and time proved that. As our nations tumble off the economic cliff and fall to destruction, prophesied in the Word of God, Barack Hussein Obama has become the President of America. Could he become the long anticipated “Antichrist”? The Antichrist will be a governing “beast” or ravenous dictator spoken of in Revelation, chapter 13. As we study that chapter, we find that even though the Antichrist is a beast he has the number of a man, and his number is 666. Thus, numbers are important indicators of the Antichrist and of antichrist activity. It is interesting that Obama claims Hawaii as his birthplace, although he has never proved that. Using his claim, however, we find some very interesting numbers. We know that Satan told Almighty God in Job 1:7 that he had come from walking to and fro in the earth, and walking up and down in it. To and fro would indicate latitude, and up and down would indicate longitude. The latitude of the claimed birthplace of Obama in Hawaii is 21.6. Those three digits that make up 21.6 are significant because the number 216 is the number 6 cubed, or 6 × 6 × 6 = 216. Obama was born on August 4, 1961, which is the 216th day of the year, another 666. We also know that Obama’s office in Chicago, Illinois, had an interesting zip code: 60606. In the ancient Babylonian numbering system of letters having numerical equivalents increasing by six for each letter, we find that the words “A messiah Barack” equal 666. We also know from Revelation, chapters 7 and 14, that the number 144,000 represents the people of Almighty God. It is the Antichrist that tries to divide them. If we divide the number 144,000 by 666, we find an amazing quotient of 216.216216. If we divide 144,000 by 216, we get the number 666.666666. Obama is also connected with Kenya, which is no doubt his real place of birth. The word Kenya is actually a feminine word pronounced “Keenya,” and it refers in feminine usage to the “cradle of mankind” in the native Kikuyu language. The literal meaning of the word Kenya is “the abode of the gods.” Even Obama’s political roots in Illinois are significant because the word Illinois is an Algonquin word which means ‘Tribe of superior men,’ or, in other words, the master race. Now, most of the above is utter foolishness in my opinion. W. Dankenbring has a history of playing around with numbers and proposing positions based upon his imaginations of what he feels the numbers mean. He has been repeatedly shown to be in error from many forecasts that he made this way (please see Teachings of Triumph Prophetic Ministries). And while W. Dankenbring has previously suggested that Barack Obama may become “the King of the World” (see TPM: Obama – King of the World? ), the fact is (as I have long wrote, please see Barack Obama is Not the Antichrist and Eight More Reasons Why Barak Obama is NOT the Antichrist), Barack Obama is not and cannot be the final Antichrist. However, without national repentance, the U.S.A. is doomed for destruction. And because of the timing of his election, President Obama will apparently (and mainly inadvertently) continue the trend towards that destruction. And while I do applaud President Obama’s announcements yesterday about trying to eliminate torture by the U.S.A. government, I do not applaud his abortion positions and do not believe that he will lead the U.S.A. to national repentance. Here is a link to another example: TPM’s William Dankenbring’s 2012 Speculation is Wrong. Here is a link to another example: TPM’s W. Dankenbring Wrong About the Sacrifice Fulfilling Prophecy, a Needed Temple, and the Date of Passover. But perhaps the most egregious negative experience I had with him was when I informed him that a written source he claimed proved a 15th, and not 14th of Nisan, Passover did not say what he claimed it did. He refused to even look at the actual proof when I offered it (see also TPM: Passover on the 14th or 15th?). He, like many, had an opinion, and did not want to believe facts that did not support that opinion. More on his inaccurate teachings can be found in the article: Teachings of Triumph Prophetic Ministries. David Pack’s fourth year non-anniversary–will those in RCG wake up yet? Today marks the fourth-year anniversary of the day that David Pack, leader of the improperly named Restored Church of God (RCG), falsely claimed that all in the COGs would come to him. As I repeatedly pointed out in that 2013 Spring and Summer, this was not going to happen. Because David Pack simply did not trust Bible prophecy, but instead twisted it in ways it was not intended to be interpreted. How could so many things happen in 24 hours? Minute 26. Three men die- Elul 24, then everyone makes a decision that day. Minute 29. Certain things about this prophesy is very complex, others are very simple. Minute 30. No way everything could happen in one day. Minute 32. Do you care most how the 3 Shephard’s die? In their sleep, by fire? Do you care who they are? If God tells us then I want to know otherwise it doesn’t matter. You are going to find out how they die and who they are. Minute 33. I know their names 100% sure. Don’t want the names out yet. Now I’m certain I know. Do you care where it happens? I don’t know where it will happen. I know how they die and who they are. I’m certain. Minute 34. How about when they die? They die sooner then we thought. Do they die together or separately. I know they die together. Two culminating events. The death of these men is the first. The central point is God is going to bring his people back together/unify his people. Saturday, August 31 will be a Sabbath unlike any other in history. It will be the first time in decades that all of God’s people around the world will be meeting together in the same locations for services. Words cannot describe the excitement and happiness that will be everywhere soon after this reunification. In many areas, much of or possibly even entire congregations might “roll over” into The Restored Church of God. Brethren will have had weeks to prepare for this and to “consider their ways” before God. Those who come will have been led to return to the Body of Christ the day before this Sabbath. Reread this last sentence. Of course, this simply did not happened. David Pack also claimed that God revealed to him that he was Joshua about five years ago. Yet, while the “god of this world” (2 Corinthians 4:4, KJV) may have done that, it certainly was not the Creator God of the Bible! Of course, it still did not happen and will not happen. The Philadelphian remnant of the COG will not become part of RCG and certainly has not done so by the dates that David Pack pointed to. The changes required by RCG would be massive for something like that to possibly happen (David Pack would have to repent, RCG would have to change focus, RCG would have to change doctrine, etc.). We expect to see thousands of you soon in The Restored Church of God. God has long planned to reunify what would become His scattered people at the end of the age. The above from RCG shows that 1) RCG does not understand the message to the churches in Revelation 2 & 3 which does NOT allow for the type of reunification that David Pack is proclaiming and 2) that RCG is still clinging to the same nonsense it claimed would happen in 2013, and when it did not happen, indicated possibly would for 2014 and still is something RCG is hoping for in 2017. No matter how much David Pack insists on error, it does not change error into truth. History will record that The Restored Church of God gathered the flock, to be with Christ, rather than helped to scatter it—as UCG, LCG, PCG, COGwa, COGaic and so many others are doing! The distinction turns on which church has the full truth and much fruit to back up claims that God leads it, not to mention that this Church still must believe there IS only one Church. I state emphatically, on God’s authority, that every last person—member or minister—throughout the world who is determined not to lose God’s Spirit—certainly many thousands—is coming to The Restored Church of God. Actually, the Bible does not teach that all true Christians will be in the same corporate organization in the end. Revelation 2 & 3 show that there will be Thyatirans, Sardisians, Philadelphians, and many Laodiceans in the end, and the implication in the original Greek is that the Laodiceans will be in different organizations. It should be stated that people will NOT lose God’s Spirit by not coming into RCG like David Pack has claimed. Actually, since RCG is led by someone I doubt is truly in the Church of God, the risk of losing God’s Spirit tends to increase for those who do support RCG. Despite David Pack’s appeals to writings from Herbert Armstrong, Herbert Armstrong never felt that those of Sardis were prophesied to come into the same organization as the Philadelphians, he believed the opposite. Obviously, we’ll have 45 days to tell the splinters, “If you think it’s bad now, wait a month and a half,” and to get them ready so they have a maximum chance when tremendous pressure comes on them—tremendous miracles and power and fear—and maybe even, they see some people they know and love die—that they not collapse. Because remember, God’s overall purpose is that they pass—that they make it. If I’m given the authority to rule them…Think of Matthew 24 and we are, we’re not going to work with them in 400 hundred groups…I’m going to tell them, “Guess what, today you’re in one organization” and they will be looking for help. They’ll…Absolutely, they all want to be together. Not the ones who aren’t converted, who are going to follow what I call the “spiritual sleeper cells.” They were appointed to this ungodliness when they crept in unawares long ago and then they rise up to do their evil according to Acts 20, verse 30, when Christ says, “some will rise among you” and so forth. Those people are not going to agree and the people who follow them aren’t going to agree, but thousands of brethren are going to be looking for direction. Maybe with or without their own ministers, so, you know, we will be in a position to say a lot of…a lot of things that I hope will be very, very helpful. David Pack originally stated all would be under him four years ago. He was wrong as that did not happen. He has also gone the wrong way on the man of sin (see also Who is the Man of Sin of 2 Thessalonians 2?). He also made a claim in a video in late July 2015 that all would come with him. RCG’s David Pack released a pompous false and arrogant video titled The Coming Signal to God’s People. In this seven-minute diatribe, David Pack claims that thousands in the Churches of God will be led by God’s Spirit to unite with him. Based on Zechariah 11:14, David Pack claims that there will be ‘a full rupture’ between the USA and Israel and this is something to watch for. That because of its (often false) literature, websites, staff, and headquarters, that RCG is ready for the coming influx of thousands that will lead to an unbelievable work. Well, I certainly do not believe that David Pack is leading God’s end time work, so in that sense it is unbelievable. David Pack claims that Wadsworth will soon be ‘everybody’s headquarters.’ That is not true. David Pack wants people to ‘walk by sight related to his campus that he claims is so magnificent that it ‘staggers the imagination.’ Yet, the Bible says Christians are to walk by faith, not by sight (2 Corinthians 5:7)–which is the opposite of what David Pack is essentially teaching. David Pack claims that it is so obvious that world events have sped up, that God must do something with RCG soon. He claims that the time when no man can work, John 9:4, is getting close. While it is relatively close, RCG is not doing that work (see also Preparing for the ‘Short Work’ and The Famine of the Word). Let me add here that David Pack has misunderstood God’s work for a long time and falsely acts like the main RCG work is to draw COG members from other groups to RCG. In the video, David Pack said that all (presumably other COG) leaders will call his message false. Well, his message is false. Yet, David Pack claims that all will realize that it is true. David Pack ignores what the Bible teaches about unity. Just like Pope Francis, David Pack does not realize that unity of the faith will not happen until after Jesus returns. He and his followers need to properly study and understand Zechariah 2:6-12 and other scriptures. Do not worry about missing the signal–you won’t. David Pack has long used ‘covetous words’ and is a false teacher. He is NOT God’s apostle nor the Elijah to come as he now also claims. David Pack’s prior prophesies related to reunification have been shown to be false in the past and will be so in the future. There is NO WAY that thousands of Philadelphian Christians will become part of RCG. David Pack’s “empire” will one day fall. See also the article Why Not the Restored Church of God? David Pack is NOT a true watchman (watch also Go, Set a Watchman). David Pack will again be proven false. Most in the COGs who hear about this ‘coming signal’ will realize that David Pack is wrong. But David Pack, in my view, remains delusional, as do many who still support him. His Plan is MUCH BIGGER and begins MUCH SOONER! Do not RCG members yet realize that this is not true? David Pack does not understand important aspects of biblical prophecy and continues to make outlandish claims that are not correct. He has admitted that he is not a prophet in the past (though he now falsely claims to be the ‘Elijah‘) and he still is not a prophet of God. Cannot those in RCG see the truth? 24 Then the fingers of the hand were sent from Him, and this writing was written. That kingdom was taken over that very night (Daniel 5:30-31). Mene: Your days being on the top as you view yourself are numbered. Perhaps in the next three or so years. Mene: Despite signs of your failure, will you finally publicly repent that your understanding of Haggai and Zechariah are wrong, or instead will you take steps to speed your decline up? Will you finally repent? Tekel: Your false interpretation of scripture and beliefs about yourself have been weighed in the balances, and found wanting. Peres/Upharsin: Your empire will some day be divided by those who will see more of the truth and leave and those who will accept your provably blatant falsehoods and stay. That cannot be the type of Church that God would want. Now, a story I often like to tell people is the old story about the Emperor who had no clothes. Basically, the Emperor was very vain about his outward appearance, and some shysters persuaded him to give them a lot of money to make the finest clothes. Somewhat similarly, David Pack wanted to build a facility so fine that all the “splinters” would see it and marvel–and he has built something that he has marveled about, yet Philadelphia-remnant Christians and even most of the Laodicean Christians are not impressed by it. In the story, the Emperor agreed to do this and then hold a public parade once the clothes were ready. People tried to shut the boy up. One or more in the audience said to him, “Boy, you are not worthy of your position as you cannot see these fine clothes.” Others said, “Wait, he is only a small boy. Of course, he is worthy of his position of simply being a boy. The Emperor is naked.” Then, when the crowd realized that no one saw the non-existent clothes, they laughed and laughed. The Emperor was extremely humiliated. People finally accepted the facts. And the facts are that David Pack has repeatedly been false. Can those in RCG now see that David Pack is NOT GOD’S Apostle? In the days of the old Worldwide Church of God, there was something which is claimed to list what some of the numbers of the Bible represented. It should be clear after four years now, that God has revealed that David Pack’s predictions were clearly false (to see some positive about four years, check out the article CCOG’s Four Years and God Revealing Philadelphia?). In the case of David Pack, he seemed to believe that if he had a new headquarters’ building that this would be enough to get people to come to him and that this was God’s plan. But it was never God’s plan, but rather the imagination and vanity of David Pack and many of his followers. Can they see the truth now or how many more false interpretations from David Pack will it take? Or is this four-year anniversary going to pass with people simply hoping that one day David Pack will be right about this? David Pack’s interpretations and predictions about what was supposed to happen remain wrong. Will you personally admit the truth? If any of you in RCG have actual facts that disprove or further support what I am writing here, please contact me. My email remains cogwriter@aol.com. Will you believe the truth and the Bible or David Pack? If you are in RCG, can you see that your “emperor” is prophetically naked (which is my opinion of what his improper interpretations show)? Can you see the handwriting on the RCG wall? Could the following apply to you? Turning to God is the only answer–and it is not just those in RCG that need to do that. This is something you can do. Do not let your own vanity get in the way. David Pack is wrong. Can you see the handwriting on the wall? Why Not the Restored Church of God? This group, led by David Pack, claims to be the most faithful. The information in this article suggests otherwise. Here is a version in the Spanish language: ¿Por qué no la Iglesia de Dios Restaurada? Leading the Final Phase of the Work Matthew 24:14 will be fulfilled and RCG is not the group doing this. Who is leading the final phase of the work? What did Herbert Armstrong and the old WCG teach about that and about prophets? Does Bob Thiel meet the criteria that the Bible and the old WCG set? What is the proof? What has the Continuing Church of God been doing? Are the Laodiceans the Modern Sadducees and Pharisees? Discusses similarities of the Sadducees and Pharisees to various COGs in this end-time. Posted in COG News | Comments Off on David Pack’s fourth year non-anniversary–will those in RCG wake up yet? Tveit, who is a Norwegian Lutheran said in remarks, “We are very grateful for the very constructive and fruitful meeting with Pope Francis today. “Through the many dimensions of its work, the WCC contributes to the unity of the church, and the unity that the WCC is able to express, in turn, contributes to the unity of humankind,” Tveit noted. Abuom and Tveit also spoke about issues of climate change and economic justice as major concerns in the pilgrimage of justice and peace. “The future of humanity is threatened; the poorest among us are already feeling the worst consequences of them. We encourage you and the Roman Catholic Church to be with us in mobilizing a real change of mind, heart and priorities,” Tveit said. The meeting with Pope Francis included common prayer for unity, peace and reconciliation. The audience concluded with a collective wish to explore opportunities to meet in 2018. The World Council of Churches (WCC) has long wanted to get the world to accept its ideas, it even has its own ‘peace plan’ (watch World Council of Churches Peace Plan). The WCC wants ecumenical and interfaith unity as it believes it, and not the returning Jesus and the coming Kingdom of God is the solution to what plagues humankind. In my view, the Vatican has been clever in how it has dealt with the World Council of Churches. The Vatican is not officially a member. This gives the impression that the World Council of Churches is not a puppet organization of the Church of Rome. And while it is not quite a puppet organization, the World Council of Churches will essentially end up as one. The World Council of Churches has, and will, advocate for ecumenical unity with Rome. This is something that the Vatican has wanted for centuries. While nearly all would deny it, the reality is that the WCC and the United Nations are actually working to set up alliances that will one day fight against Jesus! But they do not see it as they seem to have much more of a political agenda than a Bible believing agenda. The WCC also has goals (e.g. The ‘Unpardonable Sin’ and ‘Climate Change’?) consistent with those of Pope Francis and the United Nations (watch UN’s ‘New Universal Agenda’ is a False Gospel! and United Nations and Vatican Are Planning the New World Order and Will the Interfaith Movement lead to World War III?). Japanese are looking for answers after N. Korea’s launch of a ballistic missile that crossed over northern Japan. Prime Minister Abe said the incident presented a “grave threat.” Julian Ryall reports from Tokyo. The Japanese government called for an emergency meeting of the United Nations Security Council to seek a more exacting punishment on North Korea for its latest missile test on Tuesday that has significantly raised tensions in Northeast Asia. Political leaders and the public want Pyongyang to be held more accountable for actions that they say no other nation would tolerate. So, if the USA does not handle this as many in Japan want, they will want to have their own nuclear weapons. President Donald Trump slammed North’s Korea’s latest missile launch, saying Pyongyang has “signaled its contempt for its its neighbors, for all members of the United Nations, and for minimum standards of acceptable international behavior.” “Threatening and destabilizing actions only increase the North Korean regime’s isolation in the region and among all nations of the world. All options are on the table,” Trump added in a statement Tuesday. The missile passed high above Japan about 10 minutes after launch, split into three pieces and splashed into the Pacific Ocean, east of the northern main Japanese island of Hokkaido, according to Japan’s government. Deliberately firing a missile on a trajectory over Northern Japan sends clear messages from the Kim Jong Un regime: 1) we are able to do it, and 2) but, we didn’t fire it in the direction of US Guam. Although the ballistics would have been well understood (ie it wasn’t going to hit Japan), it ratcheted up the fear by triggering alerts. It demands a US response – which will keep markets on tenterhooks. Firing the rocket from a site near downtown Pyongyang’s airport also sends the US a clear challenge about limits on what a “measured” response might mean. So much for the Northerners wanting to negotiate – as the Americans were telling us just last week. You’d almost think the N Koreans were trying to wind up Trump? The North Korean leadership is playing a dangerous game. It needs to realize that if it wants to survive, it needs to change direction and stop provoking a conflict with the USA. We will see if China thinks it is time for it to act. Some troubles are bound to affect many should there be a real war with North Korea. North Korea is sending out a message of war or at least a rumor of war. North Korea did decide to back off–for now. Military issues are expected in these times. The specter of war is haunting the world right now. And though we expect, after conflict, to see temporary peace in places like the Middle East (cf. Daniel 9:27; see also The ‘Peace Deal’ of Daniel 9:27), many are preparing for war in the Orient. The fact is that the 6000 years God gave humankind to rule itself is about to come to an end. Because of that, we are to expect wars, rumors of wars, and various sorrows. We could be at or near the time of the ride of the red horseman of the apocalypse. It may start in September of 2017. We will see. A vengeful North Korea may have operatives try to detonate nuclear bombs, electromagnetic pulse weapons, and/or dirty bombs. North Korea may attempt to unleash chemical and/or biological weapons against the USA, South Korea, Japan, and/or Guam. Steps to prepare for some or all of this may have been begun by the North Koreans. 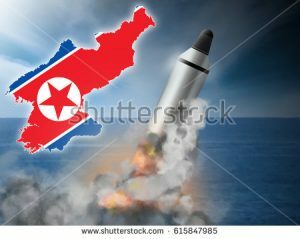 North Korea’s leaders may well decide that if they are attacked they should attempt to cause the most damage possible. Despite wars, ultimately, there is good news as the Kingdom of God will come and those issues will be gone (Revelation 7:16). Until then, we will hear of troubles, rumors of wars, wars, and the Great Tribulation. And irrespective of what happens to North Korea and Japan, eventually, one of those wars will eliminate the USA (Daniel 11:39; see also USA in Prophecy: The Strongest Fortresses). The situation with North Korea has the potential to weaken the USA in various ways many have not seriously considered. All ‘options’ may also be on the table for North Korea. Jerusalem: Past, Present, and Future What does the Bible say about Jerusalem and its future? Is Jerusalem going to be divided and eliminated? Is Jesus returning to the area of Jerusalem? There are also two related YouTube videos you can watch: Jerusalem To be divided and eliminated and God’s and Satan’s Plan for Jerusalem. THE MUM at the centre of Scotland’s incredible “poltergeist” case broke her silence yesterday. Catherine Shreenan told of the stress the whole affair had placed her under – but insisted she didn’t want to discuss the bizarre occurrences at her home. The Record revealed on Saturday how police who went to the Rutherglen house where Ms Shreenan lives with her teenage son had themselves witnessed a series of unexplained happenings. Called by the frantic mum to deal with what was described as a “disturbance” officers saw clothes flying across a room, lights going off and when they went back on the lampshades were upside down and oven doors opening and closing. A chihuahua dog which was playing in the garden was then discovered sitting on top of a seven-foot hedge. Police were called to the house on Monday and Tuesday last week. The situation has been discussed at high levels within Police Scotland, with senior officers perplexed as to how they best handle the incidents. Police sources said officers with 20 years experience at the force had witnessed the strange events and nobody knew how to proceed. Police officers who called to the house, near Glasgow, last week reportedly saw the family’s pet Chihuahua levitating and clothes flying across rooms.The mother and teenager contacted officers after being left “extremely distressed” by the “violent and unexplained circumstances”, according to insiders. But officers with more than 20 years’ service are saying they’ve never seen anything like this. The fact that the reports say that this was witnessed by police officers, indicates that this is not just a delusional report, but that something, apparently demonic, was witnessed. Yet publicly claiming something came from demons is not what most modern government officials will do. So, they are at a loss on this. 1. a ghost or spirit supposed to manifest its presence by noises, knockings, etc. The ‘spirit’ doing what has been described in Scotland certainly sounds as if it is demonic. We should expect to see increases in such demonic ‘paranormal’ activity. 3 Let no one deceive you by any means; for that Day will not come unless the falling away comes first, and the man of sin is revealed, the son of perdition, 4 who opposes and exalts himself above all that is called God or that is worshiped, so that he sits as God in the temple of God, showing himself that he is God. Thus we see that, in the New Testament, the Apostle Paul warned that towards the end, almost all would be deceived by signs and lying wonders. Deception must be clever to work, and would need some type of ‘verification’ to be believed by the masses. While most, incorrectly, feel that they can properly test/discern the spirits, that is not the case. Even most real Christians in these end times are not doing that correctly (cf. Revelation 3:14-19; see also How To Determine If Someone is a True Prophet of God). However, the ‘Laodicean Christians‘ will not be deceived like the non-Christians will be–but they will have problems because of their improper priorities (consider also the video 17 Laodicean Errors in Prophecy). Last month, on the Protestant TBN channel, I saw a news item where a Roman Catholic woman was excited about ‘speaking in tongues’ etc. She talked about signs and wonders, and the Protestant commentator was encouraging this belief. Signs and lying wonders are associated with the ecumenical movement. In the future, it is likely that the “interfaith movement” will employ “Mary,” signs, and other ideas as tools for improper unity for those who are not true, biblical, Christians (see Will the Interfaith Movement Lead to Peace or Sudden Destruction?). Satan has a plan, and deceit, signs, and lying wonders are part of it (see also Satan’s Plan). Having ‘verified’ paranormal activity will condition people to accept as real, improper manifestations in the future. We are getting closer to the fulfillment of these verses in Revelation. Likely within the next decade or two. Expect to see more ‘verified’ ‘paranormal’ activity. Close Encounters of a ‘Spirit’ Kind discusses some experiences I believe were (demon) ‘spirit’ related. A video is also available titled: Poltergeists and Lying Wonders. What is Restrained and Who is Restraining in 2 Thessalonians 2:7? Are sorceries being restrained until the future? What is the mystery of lawlessness? Here is a related article in Spanish: ¿Qué es lo que se restringe y quién lo está restringiendo en 2 Tesalonicenses 2:7? Did God Create a Devil? If not, what happened? Herbert W. Armstrong wrote this as a booklet. Does Astrology Work? Many believe and follow astrology–but does it work? Here is a link to the article in Mandarin Chinese: 占星术准确吗？ . Satan’s Plan A Brief Introduction This is a short video dealing with Satan’s plan. Do you understand the ramifications of the ‘Lady of Guadalupe’? It is claimed that a female apparition appeared near Mexico City on December 12, 1531. How has it affected the world? What might it suggest about the future? You are currently browsing the Church of God News weblog archives for August, 2017.